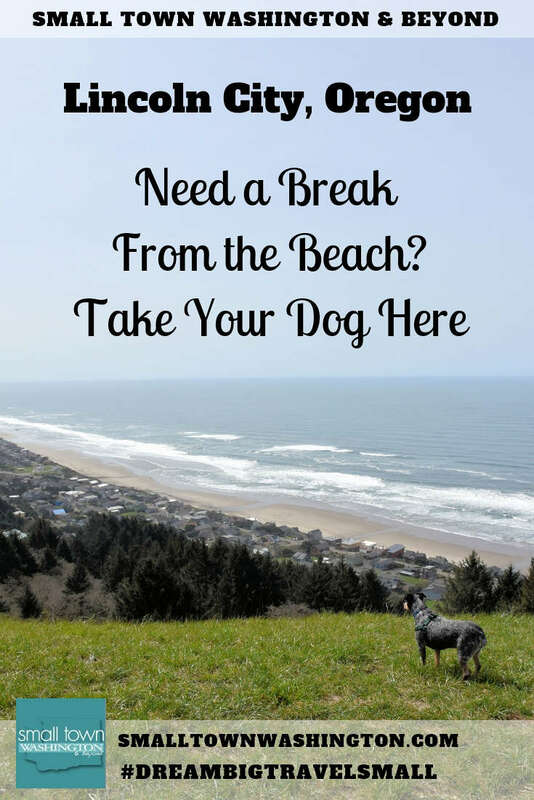 The Oregon coast is one of the best states in the Pacific Northwest to travel with your dog, as almost all of the beaches are dog-friendly. Last Spring, Hazel (my Blue Heeler) and I were hosted by Explore Lincoln City and the very pet-friendly The Coho Oceanfront Lodge. After spending a few days there with both rain and shine, I can say that the small town of Lincoln City, Oregon is one best places to travel with your pet as it has plenty of dog-friendly hotel options, a seven-mile beach with ample room to run and play, and nearby hiking trails. To get an idea of both sides of the weather on the Oregon coast, this is a sunny day at a beach we stopped at on our way to Lincoln City. This is a stormy day at the beach in Lincoln City. Love storm watching? Read Batten Down the Hatches: Four Storm Watch Hotels in the Pacific Northwest. Hazel loves the beach no matter what the weather, and would have been perfectly content to play. But, with the strong winds and bitting sand, it wasn’t time for a beach day. I had to find alternatives for my high-energy dog. What I discovered are four Open Spaces minutes from town that are perfect to walk the dog in Lincoln City. Lincoln City, Oregon has over 370 acres of Open Space Lands that are a mixture of forests, wetlands and buffer areas. While there is a blog dedicated to activities going on in the Open Spaces, I couldn’t find much information describing the Open Spaces such as acreage and total mileage of the trails. 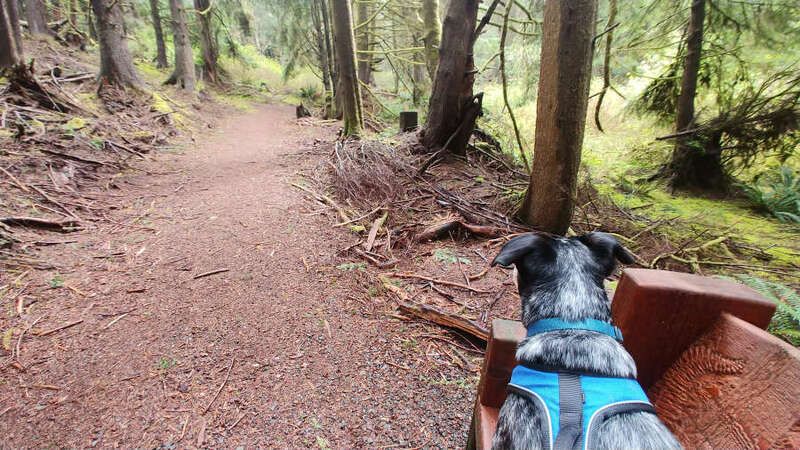 According to their Master Plan, Lincoln City Parks has plans for improvements to these areas which is good as the Open Spaces have a lot to offer visitors with or without pets. The trails are primitive and maintained, and I found it easy to navigate the trail systems with a map. Maps are not posted, nor are there map pamphlets at the entrance. I highly recommend downloading a PDF map of the Open Space to your phone before you head out on the trails. I did notice that some locations had trails that were not on the map, so they might be a little outdated. Wear hiking boots or sturdy shoes and don’t forget to bring water, or at least have some in your car. One of the best things for the budget is that visiting Open Spaces is FREE! No pass required! Travel tip: If you happen to be walking in the woods during a wind storm, always be aware that there will be falling branches and possibly trees. If the winds are extremely high, avoid the woods and play with your dog indoors. Travel tip: There are two vets in town, Lincoln City Animal Clinic (4090 NE Hwy 101 / 541-994-8181) and Oceanlake Veterinary Clinic (3545 Hwy 101 / 541-994-2929). 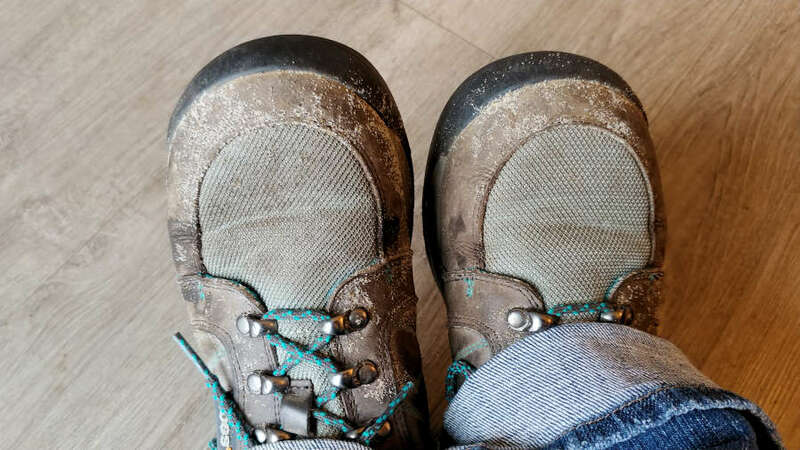 My go-to hiking shoes are my Bogs Bend Low Hiking Shoes. They also have high shoes that cover your ankles. My favorite Lincoln City Open Space turned out to be Spyglass Ridge Open Space, which I believe is the largest. The trails weave through an open wooded area with steep hills and towering trees. The elevation gain is 200 feet. Hazel and I spent a good two hours hiking around the trails and even walked some a second time as we found one trail that meandered along a small crevice with dozens of trilliums (these bloom in the spring). If you are looking for a short 20-minute hike, you’ll want to go to Agnes Creek Open Space. This area, which appears to be the second largest Open Space, has a north and a south side. On the south side is a 1/3 mile loop with an elevation gain of 90 feet. On the north side are two one-way trails that are also 1/3 mile long with an elevation gain of 110 feet. We walked the loop a couple of times and then took one of the one-way trails that dead-ended next to a marshy area. By doing that, our hiking time ended up being a little over an hour. The paths are wide and since the trails are short it is probably the easiest of all four open spaces to walk the dog in Lincoln City. Click to download a PDF of Agnes Creek Open Space. Spring Lake Open Space is surrounded by houses and has a short paved trail that is handicapped accessible, which means you’ll most likely see some people. Trails meander around a small pond, through the forest, and up to a hilltop with partial views of the Oregon coast. Elevation gain is 100 feet. We explored Spring Lake for about 45-minutes. Click to download a PDF of Spring Lake Open Space. We passed several newts on this trail, so keep an eye out! For fabulous views of Lincoln City, Oregon, and the beach, there is no better place than The Knoll Open Space. There are three starting places for this hike. I took the longer 4-mile round trip route, which started in a Cul de Sac behind the golf course. I had a tough time finding this trailhead as there was construction going on at the time. Once I got on the trail, I wasn’t sure I was heading in the right direction for there were no signs and more trail routes than shown on the map. For a good portion of this trail, I felt nervous and worried. Thankfully, I passed another hiker with a dog, and they told me I was heading in the right direction. This trail was also very muddy, and if it has rained recently, you might want to avoid the longer route. For a more direct route, there is a parking lot close to The Knoll viewpoint. This trail is .5-miles long and mostly uphill. The view at the top of The Knoll is worth the hike uphill. Don’t forget your camera! Click to download a PDF of The Knoll Open Space. To find out more about Lincoln City Parks visit their website. To find out more about things to do in Lincoln City, visit their website. Travel tip: If you are need of leashes, toys, food and more, there is a Mini Pet Mart in town (1450 NE Hwy 101). If you are looking for toys and treats, read about Hazel’s approved gift ideas for dog lovers. The Coho Oceanfront Lodge is perfect for an overnight stay with your pet. Our lower level room had direct access to a grassy area on the beach-facing side of the hotel and had the very important non-carpeted floors. There were also other dog owners on this floor, so I knew that we’d be in good company, and be understanding of each other’s dogs. Pet-friendly amenities include a small bed and treats upon arrival, poop bags, a list of dog-related places such as vets and daycare options, an outdoor fire pit where you can chill with your dog, and the hotel is avery short three-minute walk to the beach. When in our room, Hazel spent most of the time staring at the window at the ocean. Need to Knows: There is a 25 lb. pet limit and the pet fee is $25 per pet, per night. What other amenities does the hotel offer? Fresh ground coffee upon arrival, free WiFi, a free weekend shuttle to Chinook Winds Casino Resort, a complimentary deluxe continental breakfast, board games, indoor heated pool and hot tub, and beer and wine for purchase onsite. To find out more or book a room visit The Coho Oceanfront Lodge website. You won’t be hard-pressed to find additional pet-friendly hotels in Lincoln City. Seventeen are listed on their website (in the amenities tab, choose pets allowed). Some I recommend are the Looking Glass Inn, Best Western PLUS Lincoln Sands Oceanfront Suites, and Chinook Winds Casino Resort. Want to find out more about Lincoln City, Oregon? Visit Explore Lincoln City. A dogs needs are quite different than a baby’s, but in so many ways she is my baby. LOL 🙂 Thanks for commenting. I like the idea of Open Spaces- I guess bigger than a park, but not wilderness yet? In Croatian towns, we have a term park-šuma, which means something between a park and woods. Actually, I was curious so I went to look up Lincoln City on Google maps- so much green areas, now I understand how the nature looks so “wild” on your photos. I presume it’s perfect for dog owners, but also for runners and walkers. I ‘d love to visit Oregon some day! Anja, Some of the Open Spaces are really close to the mountains, and a local told me while out near The Knoll they’d seen elk on the trail. So, yes, close to the wilderness for sure! I guess the beach is always the first thing to come to mind but there are some beautiful spaces in Lincoln City to walk your dog. Being from NZ I love bush walks and beaches too. And that’s great that there are pet friendly places to stay too. Nicole, The beach in Lincoln City is so beautiful and with it being seven miles long it is really, really beautiful. I was happy or the storm to come through as that is what I wanted to see, and it gave me a reason to find alternatives to take Hazel out. I just got back from the family farm in Ohio and got to spend a weekend with mum’s blue heeler – Teddie. Teddie loved going through the woods more than anythings. All of the open spaces in Lincoln City would have absolutely made his vacation. Jenn and Ed, Yes it did. We head back there this week too! Not being a dog owner, I hadn’t realized how much need there would be for pet-friendly hotels and open spaces. But these open spaces you’ve photographed are beautiful — enjoyable for even the human companions, too! Tami, Totally get that. I really enjoyed the Open Spaces as hiking is so meditative for me. Our dog would love those walks. He grew up in the pacific northwest and loves digging through the pine forest. So cool that you saw newts, I have never seen one in the wild and would love to. Anthony, Since it was rainy, the newts were out and having a grand time. 🙂 Thanks so much for commenting! Oregon strikes me as such a dog friendly state! Thanks for confirming my assumptions. Love the videography work with the sand on the beach!! Greig, It is super dog-friendly. I keep telling the hubs we need to move there so our dog can run free on the beach! 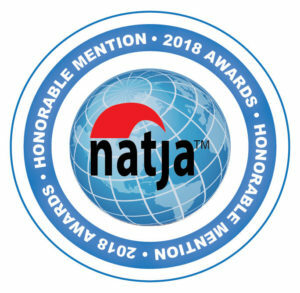 What a great post for both those who travel with their pets and those new but local to the area and looking for great places other than the beach. The open spaces look beautiful, especially Spring Lake. Kavita, It is really great that Lincoln City has so much to offer with beaches and forests. Gives you plenty of options for enjoying the great outdoors! These open spaces are one of the things that make Oregon so magical It definitely looks like there’s no shortage of wilderness around Lincoln City – not just for dog walking, but for strolling, jogging and just exploring in general. I’d especially like to check out the The Knoll Open Space – I’m a beach girl and I still like to get those salty ocean views even if the weather doesn’t permit me to take a dip! Erica, The Knoll has such a great view of the beach. Most certainly put that on your list if you visit! I haven’t been to Oregon since I was a little kid and I would love to go back. Love your photos of the beach (and beach weather) as well as the Open Spaces. They look like wonderful trails and so lush. I can see that it would be really fun to have your furry best friend along with you! Cindy, I hope you get to visit Oregon soon. The coast is a magical place! I don’t have a dog, but I can imagine it can get repetitive walking your dog in the same places each day. I like you have lots of non beach suggestions too! I love the videos, a nice take and chance to show off these amazing places! Amber, After having Hazel for 2.5 years now, and hiking where I live on the same trails, I can say I am always up for a new trail to hike! That’s great you have non-beach suggestions too. Sometimes you just need a day away. I don’t have a dog, but as a person I can really appreciate how beautiful the area is. You have some great pictures in your post, and I would definitely love to hike some of the trails you mention – or see the wind whip up the ocean. I love the idea of “open spaces.” We don’t have those on the East Coast; we just have regular city parks and state parks and such. But these all look so beautiful! I don’t have a dog to walk, but I’d happily go for a stroll on my own at any one of these! Maggie, I haven’t been to a place where they used the term Open Space instead of parks. Not sure how that got started. The name is kind of a misnomer as the space isn’t open, as in no trees, which is what I first thought of when I saw that. I had to ask a local who clued me in. I haven’t been to Oregon before but I would go on these trails without a dog. The open spaces are definitely my thing and I like the clips along the beaches. I do love the fact that they have dog friendly hotels, I love that idea, they make me want to get a dog. Mel, I love to hike when I travel and these are great places to enjoy the woods. I hiked in Spyglass Ridge when I was in Lincoln City this weekend and didn’t see anyone on the trail! Same with the last time I was there. Not sure if people were busy both times, or if, they aren’t thought of much. Beautiful places like these definitely inspires me to travel more with my precious pooches! They’d have so much fun on this beach. I really appreciate you listing the vets, that’s so important. You’ve thought of everything!